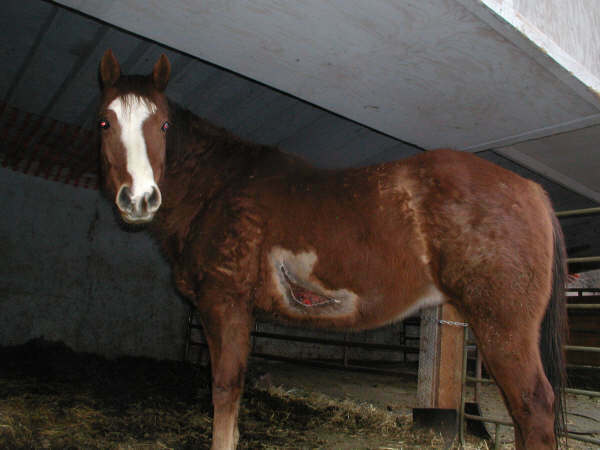 From time to time, unfortunately, we all have to deal with cuts or scrapes on our horses, and wounds come in all ages, sizes and shapes, depths and complications. There are some basic tenets of wound care. Wounds on the legs are prone to infection, delayed healing, and proud flesh (exuberant granulation tissue). Even ponies heal leg wounds better than horses. All wounds heal better in a warm, moist environment that retains important cells and growth factors as well as enzymes. Scar formation is minimized in a moist environment. Any wound over 6 hours old is considered contaminated, and much longer than that, wounds will be infected. Infection will delay or prevent healing, especially of leg wounds. Motion will delay healing of most wounds, and especially leg wounds. Confinement, pressure wrapping, splints, and casts may be necessary for successful wound closure. Primary wound care always involves cleaning around the wound, removing foreign matter and devitalized tissue (debriding), and flushing (lavaging) with copious amounts of a sterile physiologic fluid like saline. From there, it is a matter of sutures or not, covering or not, and antibiotics. Betadyne solution used at 10 ml (2/3 of a tablespoon) per liter of sterile saline or 2.5 ml (1/2 tsp) per 250 ml saline as lavage. Does not work in presence of pus or heavy discharge. Chlorhexidine solution (CHX) for contaminated wounds: 25 ml per liter (just under 1 ounce) or 6.25 ml (1 and 1/4 tsp) per 250 ml saline as lavage. Vaseline ointment to put on skin below draining wound to prevent scalding. Scarlet Oil can cause a painful contact dermatitis. Commercial hand soaps or body washes (toxic to cells). 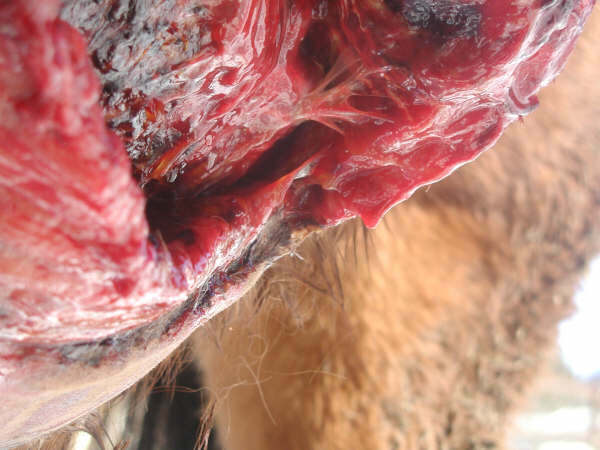 Nitrofurazone ointment (decreases wound contraction and epithelialization in horses. Blue-Kote (Gentian Violet) can cause a painful skin burn and is carcinogenic. "My horse scraped his fetlock on a tree. The hair is missing and the skin is red and weeping." Home Treatment: Clean around the wound gently with CHX or Betadyne Scrub cleaner, Vetericyn Spray, or Tea Pro Wound Spray. Rinse with Sterile saline. Pat Dry. 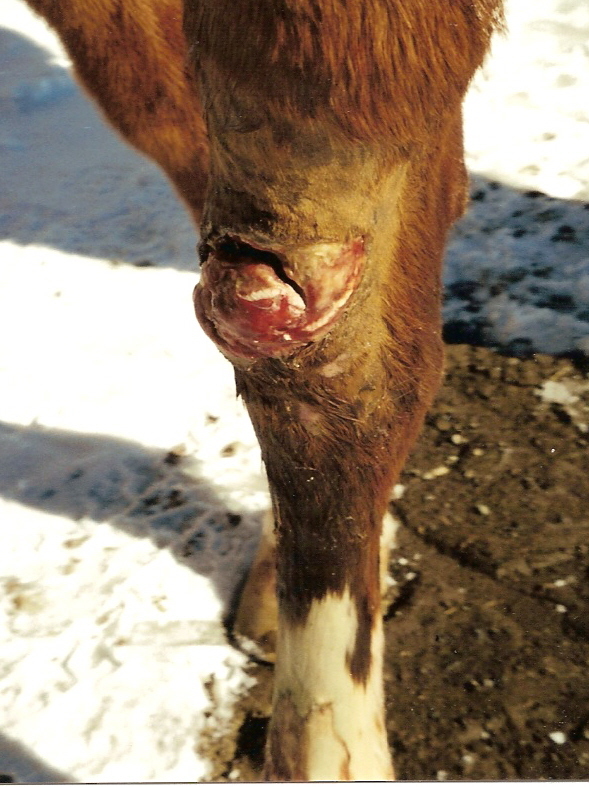 Spray with Aluspray, Nexaband or apply triple antibiotic (TAB) ointment and wrap over a sterile telfa pad or a sterile petroleum gauze pad if the area is swelling and it is an area that can be wrapped. "My mare was pawing at the neighbor’s gelding and caught the back of her pastern on the fence wire. She has a clean cut about 2 inches long, but it is bleeding and the skin is separated about 1/4 inch. It just happened. She isn’t lame, thank goodness." Home Treatment: Using a clean cloth, apply pressure until the bleeding stops. A cold compress with ice cubes may help. Wrap with saline moistened telfa, cotton and VetWrap or use the wash cloth if necessary, to stop the bleeding and prevent contamination. Also, try to remember when she had her last tetanus shot. Call the vet. Because this is low on the leg, the wound may need sutures. 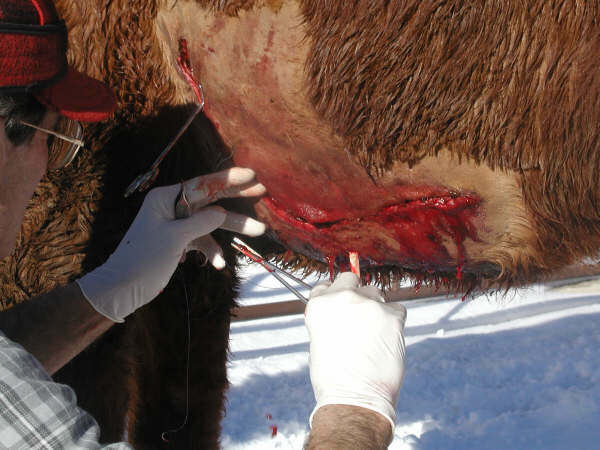 Veterinary Treatment: The veterinarian will apply sterile KY jelly around the wound and clip the hair. Using pressure from syringe or squirt bottle, he will flush the wound with sterile saline with dilute disinfectant, then pick out any hair or debris and lavage again. He will debride as needed—ragged, pale skin edges, damaged tissue inside the wound. The horse should then be confined to a stall. Antibiotics and pain relief may be prescribed. Tetanus toxoid if needed. Wrap changes at day 3 and day 6 with dressings depending on healing stage of the wound. 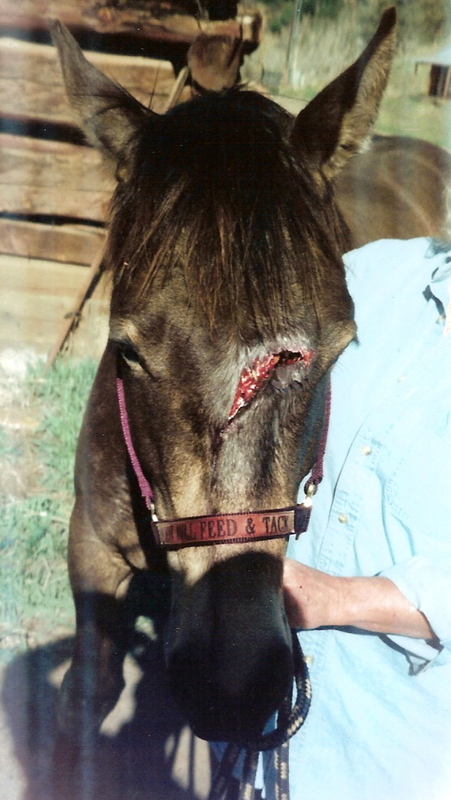 "My 3 Year-old tied to a fencepost, pulled back, then lunged forward, hitting the post. The skin is lacerated and the bone fractured over the sinus." 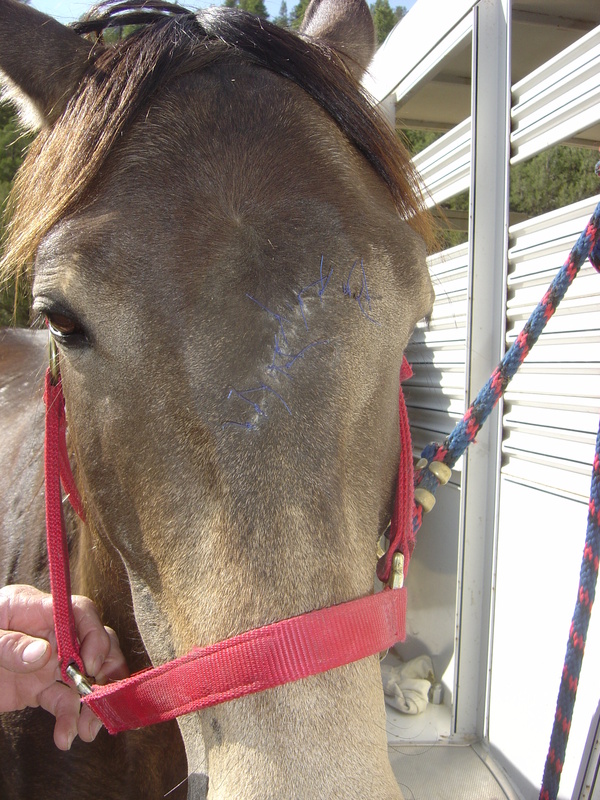 Head wounds heal well but fragments of bone must be removed from the sinus and tissue trimmed before suturing. Call the vet. It'll take about 3 weeks to heal. "My Horse has a dirty, crusty wound from 3" below the knee to 2" above the fetlock. I found it several hours ago. It's not too deep but frayed edges are curling and dry." Home Treatment: Hose the wound gently, from an angle, and wash with CHX scrub and rinse thoroughly. Lavage with sterile saline. Apply Wet to Dry Dressing covered with Kling or brown gauze, cotton, and VetWrap. Call the Vet. Check on last tetanus shot. Confine. Wet to Dry Dressing: Take 6 layers of sterile gauze sponges. Wet the layers with sterile saline and squeeze out excess moisture. Apply the damp sponges directly to the wound, then 2 or 3 dry sponges, then roll gauze, a cotton leg wrap, and finally VetWrap. 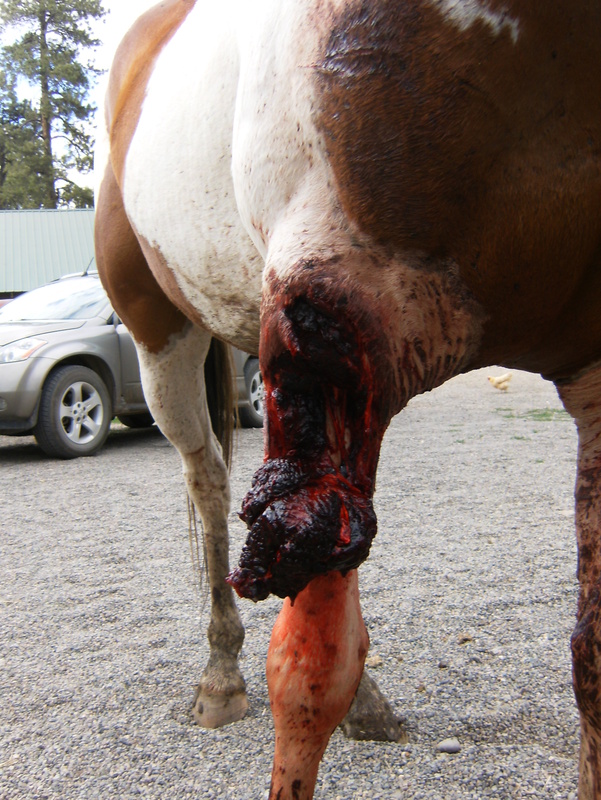 Veterinary Treatment: This is a moderately contaminated/INFECTED wound with exudate. Treatment will be more extensive and prolonged and antimicrobial packs will be used in the wound. 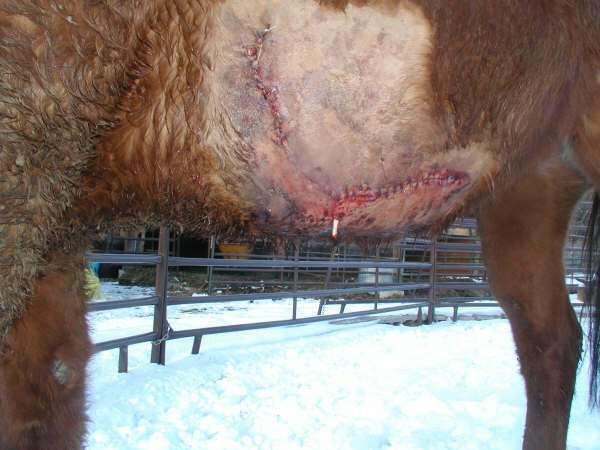 Any possible suturing will have to wait until all infection is controlled and devitalized tissue removed. Found the horse this way down in a pasture in Arboles. It had a huge wound across chest and forearm with muscles hanging down, and deep tear into the muscles. Unknown time, but still weeping serum and blood with crusting, and some exudate. Home Treatment: Call the vet. Don’t move the horse unless stable. Hose wound while waiting with water directed at an angle and wash around wound with CHX or Betadyne scrub, but don’t soak tissue. Check Tetanus status. Offer water if the horse has not been able to get to water. Veterinary Treatment: Pain relief, systemic antibiotics, Bute, tetanus toxoid when needed. Extensive debridement and lavage, sutures where possible, drains when needed, and overwraps placed by using a laced on sterile towel. 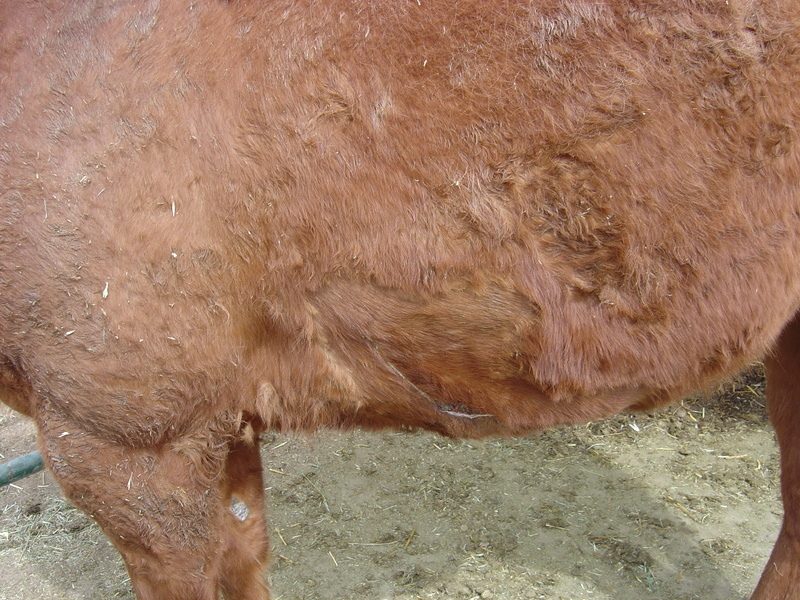 Found horse in pasture with stinky wound on outer and back pastern with pus and discharge. Home Treatment: Water, CHX scrub gently, rinse with sterile saline. Apply Wet to dry dressing as above. Call the vet. This will need serious cleaning and debriding and a heavy wrap or cast. Veterinary Treatment: Clean as above. Debride and lavage. Wet to dry dressing 24 hours. Systemic antibiotics, Bute, check tetanus status. Daily, lavage and debride and re-wrap, with possible suturing in the future after infection controlled and devitalized tissue removed. A boot cast may be applied eventually to decrease motion and allow the wound to heal. Horse found in electrobraid fence with wire wrapped around left-hind cannon bone. Bone exposed through skin and tendons. Home Treatment: Call the Vet. Call the vet. Move very carefully after wrapping up if possible. This is life threatening depending on degree of tourniquet effect and subsequent gangrene. Wound management with exposed bone is specific and critical to avoid infection. Wounds through the extensor tendons on the front of the leg are less serious to athletic performance than wounds through the flexor tendons on the back of the leg. Veterinary Treatment: Pain relief, antibiotics, and consideration of shock. Tetanus toxoid if needed. The veterinarian will clip and clean as above with lots and lots of sterile saline with 1:40 CHX, debride frayed and devitalized tissue and suture where possible. He may consider drilling or curetting the exposed bone to stimulate healing. A dressing that stimulates granulation over bone may be used under a heavy wrap and possible splint, and the dressings will be changed daily after repeated lavage. X-rays may be indicated initially and several weeks into healing to assess bone reaction, and presence of dead bone that may retard healing. Once remodeling begins (7 days to months) the vet will consider using dressings that retard exuberant granulation tissue and scarring. 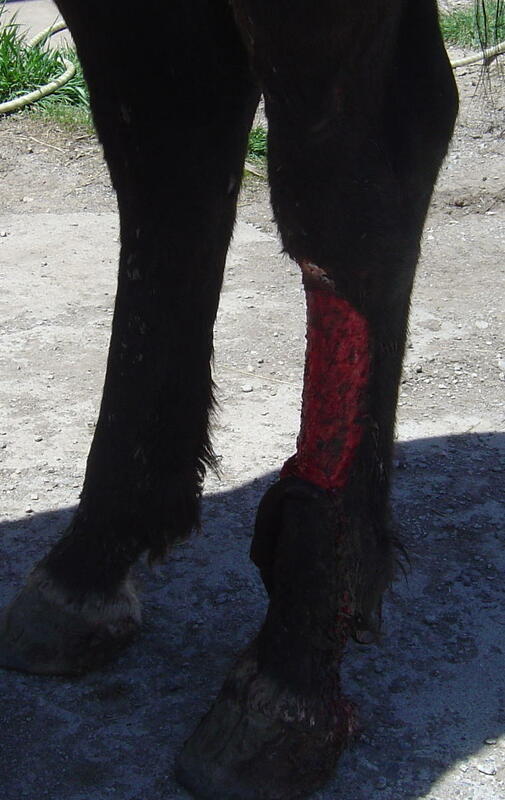 Most rope burns occur on the hind leg and they are a combination of abrasion and thermal damage to skin and underlying tissue. They are classified like burns—1st degree to 3rd degree. All of them are painful and most horses are lame. They can take 3 weeks to months to heal. Home TX: Cold water soak for 30 minutes—ice water is best. Apply Triple AB ointment, cover with telfa, cotton, and VetWrap. Call your vet for further advice. 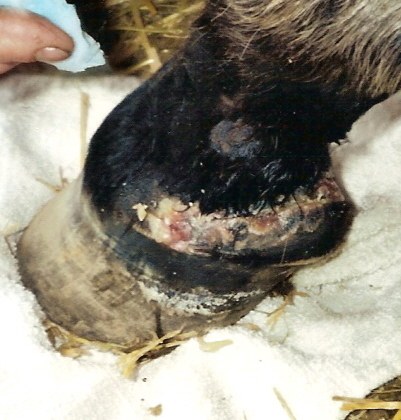 Vet TX: The veterinarian will check for laxity in case of damage to underlying tendons or ligaments, clip and clean, debride and lavage as above. Treatment may be repeated if deep tissue damage becomes apparent over time. The wound will be dressed and wrapped. The owner will need to cold soak 30 minutes 3 X daily for 2 days and apply TAB and wrap between soaks, then change the wrap every 3 days. Bute for pain control. Inadequately treated wounds on the legs are prone to producing excessive scar tissue called proud flesh that protrudes above the skin edges. This tissue must be controlled because wounds cannot “contract” and skin cells cannot “climb” over scar tissue. The veterinarian must trim this granulation tissue level with the skin and then use dressings that retard regrowth of the tissue under wraps until delicate skin cells can close the wound. Proud flesh does not have developed nerve endings so it is not sensitive, but it has an extensive blood supply. Newly healed wounds take up to two years to strengthen and mature. .
“Degloving” fence wound on the hind cannon bone-lots of time and wrapping saved the leg.